You’ve heard the story: Exchange your old-fashioned internal combustion engine for an electric one, and change the world. Turns out it’s more complicated than that. While driving an electric car generally saves on emissions, building one is way more energy-intensive than building a regular gasoline-based vehicle. It’s costly, energy-wise, to procure and process lithium for batteries and to create complex, lightweight materials, like carbon fiber, that help EVs extend their range. One analysis from the science advocacy organization Union of Concerned Scientists found that manufacturing an electric vehicle results in about 15 percent to 68 percent more emissions, depending on the size of the vehicle and its battery capacity. That same study found that EVs make up for the emissions disparity once they hit the road, but corporate minds—and eco-watchdogs—are eager to close the gap. Which is why Audi is touting advances in its new E-tron electric SUV facility in Brussels, Belgium: the first factory churning out premium, high-volume electric vehicles to be certified as carbon-neutral by the European Commission. The E-tron launched into full-scale production there last September. “The answer was obvious: Minimize the energy consumed and use different types of energy production to begin with,” Patrick Danau, the plant's director of production, technology, and logistics, said during a tour of the 540,000-square-meter factory in early March. Around him, autonomous-obstacle-sensing moving platforms shuttled parts around the sprawling centers. (At one point, two of them bumped together. The factory is still working out the kinks.) Scores of robots assembled batteries, welded pieces together, and pirouetted vehicle chassis through the air, giving vehicle workers access to the EVs-in-progress as they moved from station to station. Audi workers assemble the E-tron's battery pack. The company is the only EV manufacturer in the world to assemble its batteries under the same roof as the car itself. 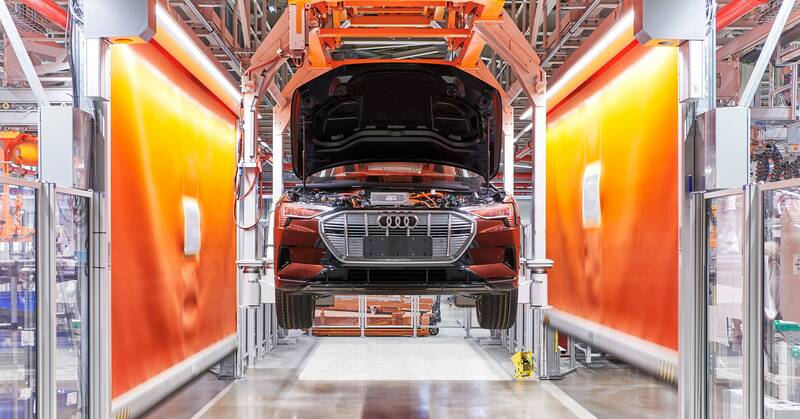 Greening step one for Audi, which is owned by Volkswagen, began with the building itself, as it prepared to convert an A1 compact hatchback assembly plant to one equipped to build the E-tron. It set up a 37,000-square-meter photovoltaic farm on the rooftop, which cranks out 3,000 megawatt-hours of electricity per year. This saves the complex 700 metric tons of CO2—equal to the yearly energy use of about 85 homes. The solar cells, which nearly blanket the facility’s multiple structures, reduce the plant’s total grid-based electricity consumption by 95 percent. The factory also puts a dent in its electricity consumption by using high-efficiency heat exchangers to control the temperature of different areas in the factory, which Audi estimates saves it another 4,000 tons of CO2 emissions annually. The carmaker says it finds the rest of its carbon savings by making environmental choices when it can. For example, Audi purchases carbon credits to offset less savory but, for now, necessary practices, like the incineration of used solvents from the assembly process. It also uses biogas to heat the facility. It is not clear whether other Volkswagen Group brands, including Porsche, Bentley, Lamborghini, and Seat, will follow Audi’s green lead on electric cars. They do have some motivation: The entire company was affected by the fallout of VW's global Dieselgate scandal, when it was caught cheating on vehicle emissions tests. The scandal (and the ensuing legal settlements) were big motivators for VW’s electric-vehicle development. And since then, the company has committed to making its production facilities carbon-neutral by 2030, even if it’s manufacturing internal combustion engines inside them. VW has said that the Stuttgart factory set to start producing all-electric Porsche Taycans by the end of the year will be carbon-neutral, but won’t provide more details than that. If the company can keep making advances in electric vehicle manufacturing, it could give another green light to the planet-friendly cars.